My wife and I have had season tickets to the American Players Theater for many years. 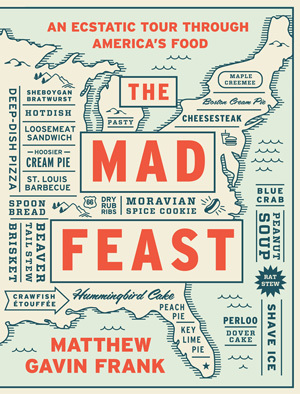 In mid-November we were heading to Spring Green to catch one of the plays and decided to stop on the way at Arcadia Books for an author reading from The Mad Feast: An Ecstatic Tour Through America’s Food. Some of the state dishes that are profiled in the book include deep-dish pizza (Illinois), hummingbird cake (Alabama) and, of course, bratwurst (Wisconsin). Frank was a passionate and engaging speaker and we enjoyed his quirky writing style (the passage read was on the Minnesota hotdish). We were treated to a sample of hummingbird cake prepared by The Kitchen (the bookstore’s café). All in all, the afternoon was a delightful prequel to another lovely evening at APT.